if you are an studied economist – can you think outside the box? Asking for “meaning” in life? What is “REAL” value? What is “meaning”? is killing people “REAL” value? Does it give your life meaning? why is a real estate agent – buying and selling houses – constantly increasing rent and profit – highly valued and privileged by society? but the work of a nurse not? again – ask for the value. value to whom? to society i assume. what society? the 1% society? or the 99% society? one assumes here the 99% society because anything else would be catastrophic for 99% of society – which by no moral standards can be “good” or “accepted”. so if i buy a house – (with debt money) – in order to sell it as soon as possible – at the highest possible price. and i succeed – what value did i add to the 99%-society? even worse – i just managed to drive up house priceses – and houses are not statues – people need them to survive. even worse – the real-estate-agent – because of lack of consciousness – is completely unaware or selfishly ignorant towards the fact – that he/she is NOT adding value to the 99%-society. unaware = stupidity, could be changed with education. ignorance = could be changed by training consciousness, if not it will bring about catastrophe for all – this i can gurantee you. 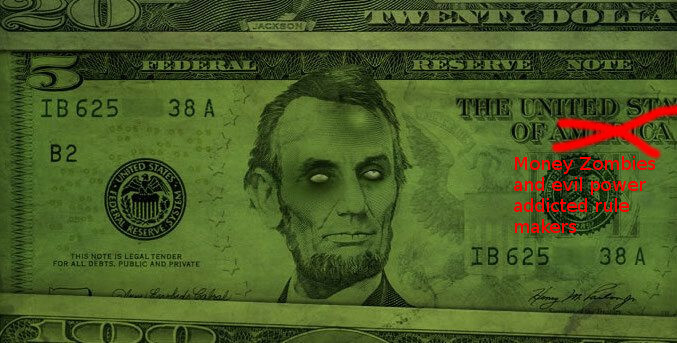 this debt-money operating system of society (DMOSOS) – is like a zombie – it exists – but for no reason. their agents are in “zombie” mode – meaning – they continue what profits them – regardless environmental and social costs – even ignoring the fact – that they are working towards their own destruction. A suicidal meaningless lifestyle. But “fun” – because highly valued by the DMOSOS. long term – it will not only crash the stock market – but mankind and it’s ecosystem. this can hardly be labeled “success”. PS: “the box” is the rule and mode of thinking that was trained by highly intelligent but brainwashed people at universities and schools. Their self-confidence derived from feeling of importance – being invited to events including drinks and snacks for free – makes them do that. But what is better? Being brought up a stupid Taliban? or a highly intelligent Taliban? It is still an extremist viewpoint – neglecting the right to life to anybody that thinks different. In this terms – university professors are “the Talibans”.